Life has a way of coming full circle – something to remember in these mad, maddening times. Burdened by the cross of our sins and our fears as a nation, and staggering under the weight of all the things that we know to be true even though we wish they weren’t, many of us feel helpless in Pakistan today; as if we are ineffectively digging our heels into the ground as we get dragged closer and closer to a yawning abyss. Equally the victims and perpetrators of injustice, we throw punches where there is only air and we protest by crying wolf. Our eyes fixed on what we are afraid lies ahead, we fail to look back; but if we did, we might notice that all along the trail of desolation and violence left behind us, life continues to quietly reassert, restructure and rebuild itself. For all the mayhem that people cause, the ability to recover is a fundamental building block of the natural and spiritual world and so, every once so often, life will come full circle. The question is: will you be there to see it when it happens? 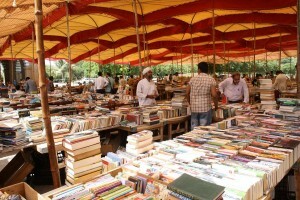 This is the sense I had when I visited the Frere Hall book fair in Karachi earlier this summer. I had last been here seven years ago, accompanied by a photographer friend visiting from the US. We had gone to see the historic building on a Sunday morning and had been caught completely by surprise at the sight of a sprawling, tent-covered area lined by tables upon tables layered with books. The hall famous for its ceiling mural by Sadequain was not open to the public at that time, but the caretaker let us in. It was in terrible shape: dark, dusty, unused. The window panels, he said, had been shattered during the bombing at the US consulate two years before. No one had bothered to fix them, but (and at this he pointedly looked at my white American friend) he could take it upon himself to do the job if he had the money for it. The talk of bombing, the smell of decay and the enormous bee hive in one corner of the ceiling was making it was difficult to concentrate on the beauty of the mural. It was as if Frere Hall was still in mourning for what had come to pass in its environs on that day in 2002, when a vehicle full of explosive had blown up outside the consulate and killed over 50 people. We thanked the caretaker and gratefully escaped into the sunlight, where we spent several hours browsing through books and taking photos of the booksellers. I found out later that that was the last year the book fair had been allowed to run in those gardens. As the consulate moved to secure its surrounding areas, Frere Hall and its lawns were closed off to the public entirely. It made me angry to hear this. The presence of those books and those people had signified something critical in our post-9/11 country. I felt that the residents of Karachi had been consistently robbed of such simple pleasures as reading and picnicking at precisely the time when they needed them most and that the closure of Frere Hall was a towering symbol of this. Two years later, there was another bombing at the American consulate and I remember thinking at the time that this building would probably remain closed for good. Life moved on and in January of 2011, I shifted with my family to Karachi. Five months later, the news came: the book fair at Frere Hall was being resurrected. It would run from 8 am to 7 pm every Sunday. The US consulate had shifted to a new location and in its wake, the revival had already begun. My husband and I went at the first possible opportunity and we were not disappointed. The set-up was on a more modest scale than before, but it was still big enough to keep us busy for far more time than we had to spare with two children in tow. The original sense of being able to find bargains was still very much intact and the fair retained its quirky flavor: we were delighted to find books that were not available in regular bookshops. My husband found the third book in a trilogy that his father had been trying to complete for several years. I found English classics, Tintin comics and a title that was so interesting that it simply had to be purchased, regardless of whether one ever got around to reading it. Where else would you find this? 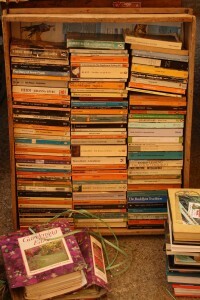 What a joy to lug those books home. What a joy to soak in that atmosphere: children playing in the grass, people quietly browsing through book stalls and a steady stream of visitors flowing through the newly renovated, gorgeous Sadequain Art Gallery, now beautifully lit with repaired windows and an exhibition in progress. Frere Hall was reborn and with it, symbolically, so was the cultural heart of an entire city: momentarily arrested, but now beating, alive. 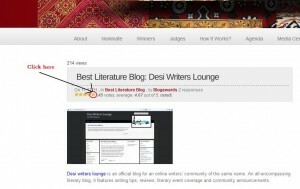 We are so excited to be competing on this year’s Pakistan Blog Awards! Being a community (instead of an individual) gives us a unique edge over other contestants in the Best Literature Blog category. As a writing forum, literature is what we do. Our members produce original material that we help workshop, edit and publish in our own literary magazine, Papercuts. The magazine also provides a platform for writers looking to get published who are not members of DWL. One of the central functions of the DWL blog, therefore, is to give out updated information on the writing community and the magazine. But that’s just the start of what this blog covers. We cover literary events (see our blogpost ‘Critical Reading: The Murder of Manto’ for instance, or our coverage of the Karachi Literature Festival 2011). We share writing tips (see Noorulain Noor’s posts on writing techniques as an example). We comment on news in the literary world (see our take on the Greg Mortenson affair). The next step on the cards is to start featuring reviews. So why should you vote for us? 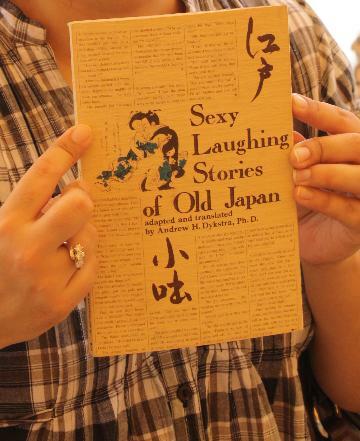 Because if you’re interested in literature, there’s so much you can take away with you from this blog. 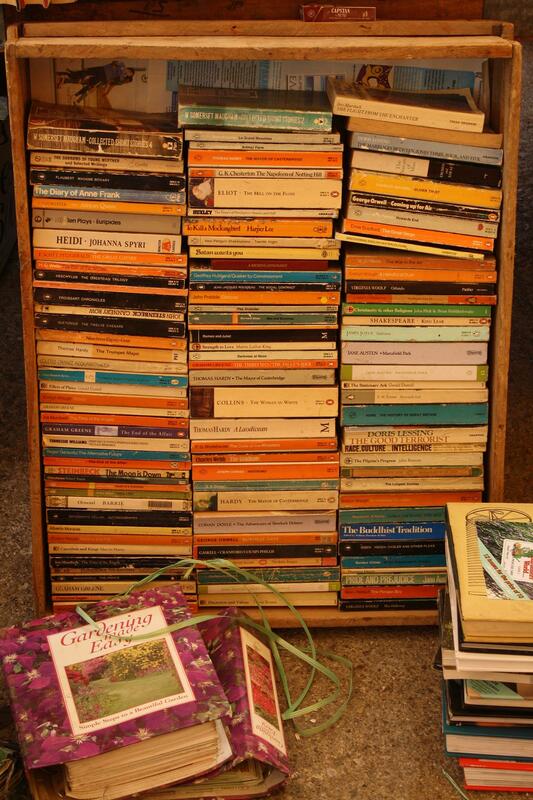 It’s not just about amateur poetry or the latest book someone’s read; nor is it region specific: it’s about everything to do with literature. And that makes us relevant and different. 2. 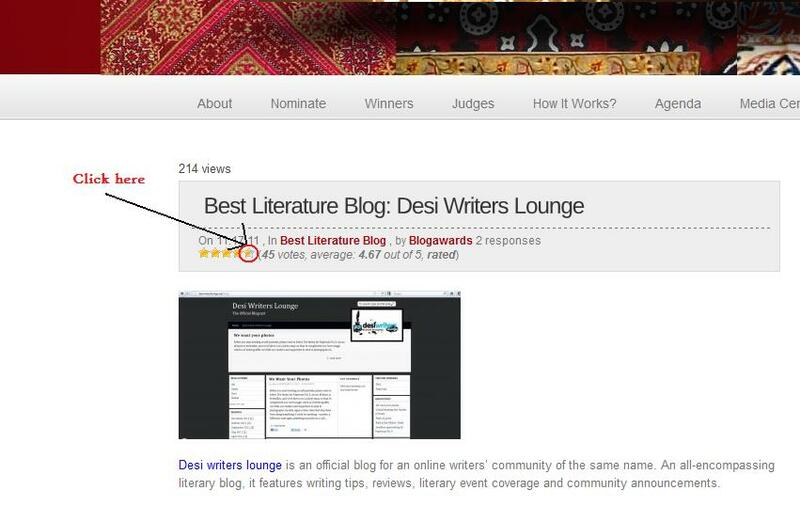 Scroll down until you see the heading Best Literature Blog: Desi Writers Lounge. 3. You will see five yellow stars underneath that heading. Click on the fifth star on the right to give us a high rating. We’re attaching a picture to make this easy for you. 4. Wonder at how easy it all was. (This step is optional). A big thank you to everyone who helps us do this! Before you start sending us self-portraits, please read on below. The theme for Papercuts Vol. 8, as you all know, is Forbidden. And we’d like to run a photo essay on that. 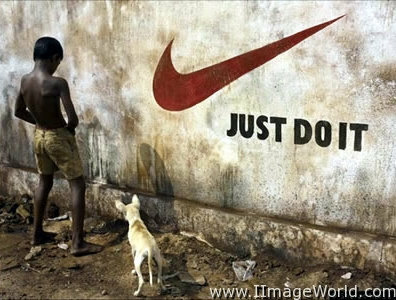 To complement our cover image, which is of street graffiti, we’d like our readers and supporters to send in photographs of public signs in their cities that stop them from doing something. It could be anything – a poster, a billboard, road signs, something scrawled on a wall – but it must be interesting. An example would be the all-too-familiar advice one sees on walls in Pakistan: Yahan peshaab karna manaa hai (It is forbidden to urinate here). There are loads of other examples as well; once you start looking for them, you’ll be surprised at what you’ll find. Please, please just don’t send us a photo of a stop sign. There are limits to our conceptual patience. Thank you. As always, send in your material to editor.papercuts@desiwriterslounge.net. We are extending the deadline to 1st December 2011. If selected, your photograph will be credited with YOUR name and published online as part of a photo essay linked on the Papercuts home page. If it’s your city, how come there’s so much you can’t do in it? Your camera will help you think that through.